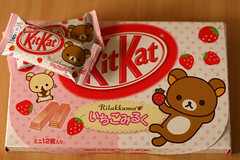 Rilakkuma is a… hmm… bear character of some sort. Beloved of little girls, presumably. I dunno. I’ve no desire to put any effort into researching it, or explaining it. Please don’t explain it to me. 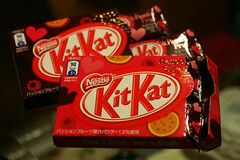 The KitKats are a creamy strawberry as the name suggests, but by Jove (I’m feeling very English this afternoon) they’re sweet. And being an omiyage pack, there are a lot to get through. We’ve met kinako before, in special omiyage edition, and in the 5-star bar edition, so you know then that kinako is toasted soy flour, right? Doesn’t sound too tasty in English, I’ll grant you. An ohagi is another one of those traditional sweets that I avoid, on account of it being a mochi (soft rice cake), filled with azuki beans, and coated in the aforementioned toasted soy flour. I know. Ideas on what constitutes sweet treats differ greatly from culture to culture. Well, there’s very little of the ohagi, and quite a lot of the kinako, which means a lovely nutty flavour suiting the smooth milk chocolate. By my crude rule of thumb (noting how many were left in the shop and for how long) these were not terribly popular with the locals, probably for the very reason I loved it. 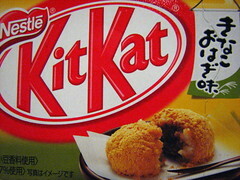 It’s a nutty KitKat, not an ohagi. 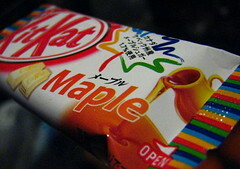 In the pantheon of Japanese KitKats, it had to come up sooner or later – Miso. Have to say, when I see a gloop of miso (to use the official term), the last thing that springs to mind is sweet sugary treats. 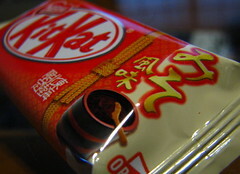 And oddly, when you pop one of these in your gob, the last thing that’ll spring to your mind is miso. It’s another one of those vaguely-caramel-if-we’re-grasping-for-a-flavour editions, by no means offensive enough to scar you. In fact won’t leave much of a mark on you at all. Coming in both pink and brown boxes adorned with hearts and gold lettering, it’s a deliciously rich raspberry and passion fruit in dark plain chocolate. 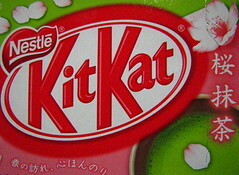 We’ve had this flavour before – in the minis that came with KitKat Happy Break this time last year. This feels a bit more luxurious though, and so it should as a Valentine’s special. 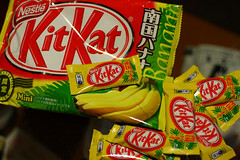 Limited to Kyushu and Okinawa, it’s a very bananarey banana. Almost a bit too bananarey (I may have to copyright that) but only almost. Not quite as good as I remember previous incarnations of banana. But having said that, I still managed, of the course of a few days, to finish the whole bag. Anyone who can’t bear artificial banana flavour, and I know there are a good number of you out there, may want to steer clear.